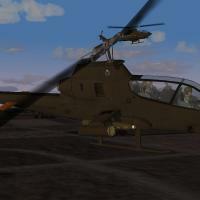 This is a third party add on of the AH-1GCobra using models and cockpits created by me. 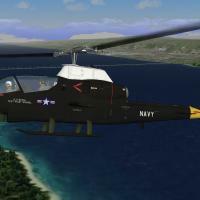 The original flight model is standard as on many free to download helicopters. I have just modified it a bit. This is freeware-donationware; it CANNOT be distrubuted unless permissions are granted by myself. Any persons wishing to make further modfications, MUST remember to put everyone's name in it. This addon works only with my WeaponPACK (Included in rar file) All of weapon stations are made as specific station code and will work only with this weapon pack. 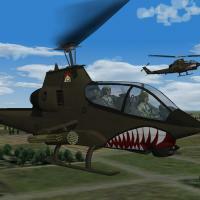 For Spanish AH-1G Z-14/HA.14 Cobra there is seperate folder with additional weapons made for Spanish model. It should be instaled same way as other weapons. AIRBRAKES - sun filter/shader on off - just for fun no airbrakes so empty animation slot for use. ARRESTING HOOK - jump from pilot station to gunner station. - nose lights activate/deactivate in early model. Lights must on. A2A mode - gunner station guncross for turret. A2Ground mode - pilot M73 cross. This is totaly new file. I highly recomend to backup your old files. OR just delete all old files. This is totaly new files and will not work in many parts with old. 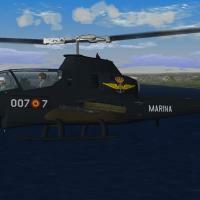 For take off: Around 75% of throttle vector (small needle on RPM clock in cockpit should be like 65degree up) - (default ctrl + ) and then increase power to 70-85% (or more for quick lift) and pull controll stick little and snake will take off. Then reduce throttle vector as needed and reduce power to 69%. It should fly around 110kts now. 69% is about cruising speed. When on the ground you can see rotating blades for pitch and roll. Just additional and unnecesary thing (not visible so much when flying) but it is possible so it is there. Not working like i want but better then nothing. There are two different pylons on inboard stations one for rocketpods one for gunpods. Just to have a proper angle of fire with GP. It is not proper for real model but in my opinion best what can be done for SF engine. Rocket pods are ok with correct angle on inboard stations. 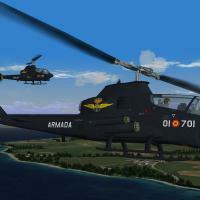 HA-14 Cobra of Spanish Navy. All serial numbers are historicaly correct. I have redone all weapons - launchers M159,157,158,M200, and some navy LAUs. 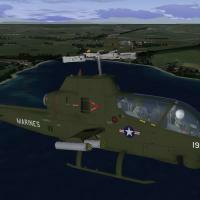 Gunpods M18 and navy SUU-11. XM118 smoke dispenser. Guns are loaded as weaponstations so player got options. 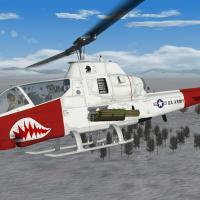 I am using helopilots by OldDiego. 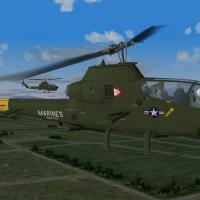 Some pilots models might be too big for this helo. Copy all files into specific folders. You will need to add the following to your Nations.ini file which should be in your Flight folder. Updated weapon data pack with new skins and some new models for weapons. Fixes on extent points, and some small model fixes. New slow/fast rotor model with new tga file. Comes with all required weapon files. fixes at external .lod model. new skins, some parts remapped. small fixes in ini files.